"Keep it Moving? Conserving Kinetic Art"
A 1980s view of the organic materials laboratory at the GCI’s first home in Marina del Rey, California. Photo: Paul Slaughter, for the GCI. Well-organized conservation research facilities, large and small, were created throughout the twentieth century in Europe and North America: the Museum of Fine Arts, Boston (1930), the British Museum (1931), the National Gallery, London (1934), and the Institute Royal du Patrimoine Artistique, Brussels (1948), to name a few. But professional conservation as we understand it today really took flight in the early 1950s with the creation of an international professional association, the IIC (International Institute for the Conservation of Historic and Artistic Works), a journal, Studies in Conservation, and the first regional center in the United States, the Oberlin Intermuseum Conservation Association. Other laboratories quickly followed: the Freer Collection (1952), Rome’s International Centre for the Study of the Preservation and Restoration of Cultural Property (1959), the Centre de Recherches sur la Conservation des Documents Graphiques, Paris (1963), the Conservation Analytical Laboratory of the Smithsonian Institution (1965), and the Canadian Conservation Institute (1972). The Getty Conservation Institute (GCI) was created against this backdrop. Harold Williams (first president and chief executive officer of the J. Paul Getty Trust) and Nancy Englander (the Trust’s director of Program Planning and Analysis) formulated their ideas for GCI Science after visiting many of these conservation facilities. They concluded that scientific research tended to concentrate on specific collections and that there were few places to go to investigate new problems. Williams hired Frank Preusser from the Doerner Institute in Munich to create the research facility in 1983. How do you build a science department for an institute that hasn’t been created yet? A difficult question—and precisely the directive the first science chief of the GCI was given in the early 1980s. What should be the emphasis of the work? To him, the following analysis seemed obvious. First, build for the future by hiring mostly young scientists and giving them experienced mentors to supervise their work. Second, establish a credible early track record by contracting research to established laboratories with histories of productivity and publication. Third, recognizing that a conservation laboratory couldn’t compete with any one industry in developing new materials yet would potentially dip into many, use industry as a resource for existing materials that could be applied to conservation problems for the first time. In many ways, the work of the GCI in the past thirty years has evolved to reflect this increasingly holistic view of conservation and an integrated approach to practice. Before turning to a more detailed consideration of this evolution, it is worth reflecting on the place of the GCI in the context of other conservation organizations. Journal articles often reflect what’s considered cutting-edge knowledge in conservation labs at the time and offer snapshots of hot topics by decade. Technical Studies in the Field of Fine Arts (Fogg Museum, Harvard University), the Journal of the American Institute for Conservation, and Studies in Conservation were initially dominated by contributions on artists’ techniques and materials, treatment case histories, and other single object studies (this was found to be true as recently as the 1990s).1 Newly developed specialized tools were discussed but with much lower frequency. Occasional papers on color science, air pollution fundamentals, infrared reflectography, and the use of advanced tools like gas chromatography and mass spectrometry for binder analysis were evident but numbered just a handful during the first few decades of Studies in Conservation. By the 1970s a subtle change was evident. Artists’ techniques and materials remained the most popular topics, but new tools were expanding the possibilities of what we could learn from increasingly smaller samples. In addition to polarized optical microscopy, papers were published on infrared spectroscopy, X-ray diffraction, scanning electron microscopy, and X-ray fluorescence. In 1966 gas chromatography was introduced for the analysis of dried oil films, and within ten years major holdings in museum collections were being compared using these once-rare techniques. In the early 1980s conservation science began examining the distribution of, and building physics for, what we would soon call agents of deterioration. The infiltration of air pollution into the museum environment and its effects on a host of materials was a favored theme. Like others, we were discovering that indoor-generated air pollution was often a greater risk to materials than outdoor varieties. Simultaneously, science began exploiting advanced industrial materials like Parylene and employing unique technologies such as digital image processing to reinterpret X-radiography and other forms of technical photography. Scientific research began to show clear signs of self-awareness with published reports on the scientific needs of the field and road maps on how to meet them. A 1979 report recommended a National Institute for Conservation (NIC). The GCI, with its structural flexibility and ability to leverage in-house facilities with contracted research, was perfectly poised to exploit these new horizons. In November 1984 a new report, “Proposed Priorities for Scientific Research in Support of Museum Conservation,” was released by the National Institute for Conservation Scientific Research Priorities Committee. Notwithstanding the fact that a “United States National Institute” didn’t actually exist in any physical form, the committee proposed ten ambitious areas it thought needed investigation: influence of atmospheric pollutants on collections; biological sources of deterioration; development of conservation materials and treatments; characterization, deterioration, and stabilization of organic materials; environmental control and monitoring; deterioration introduced by treatments and environmental conditions; standard test procedures; health hazards; mechanisms of deterioration and preservation of excavated artifacts; and the preservation of modern materials. Excepting two areas, biological sources and health hazards, GCI Science was about to tackle the whole list. Knowing it couldn’t acquire this broad range of expertise in an internal research program, the Trust gave Preusser a substantial budget to fund sponsored research at other conservation institutions and universities. These were not grants to external researchers, but rather “works for hire” where the GCI provided funding and played a major role in designing the research. Not all of these priorities were pursued immediately. Before 1985 the GCI was only a science department of four people inhabiting the main living room of the Ranch House—J. Paul Getty’s original residence in Malibu (site of the current Getty Villa). In 1985 the GCI moved to a new facility in Marina del Rey and underwent an inflationary “big bang” of its own where its staff and facilities expanded twentyfold. The science program comprised four sections: analytical chemistry, materials properties, conservation processes, and extramural research. 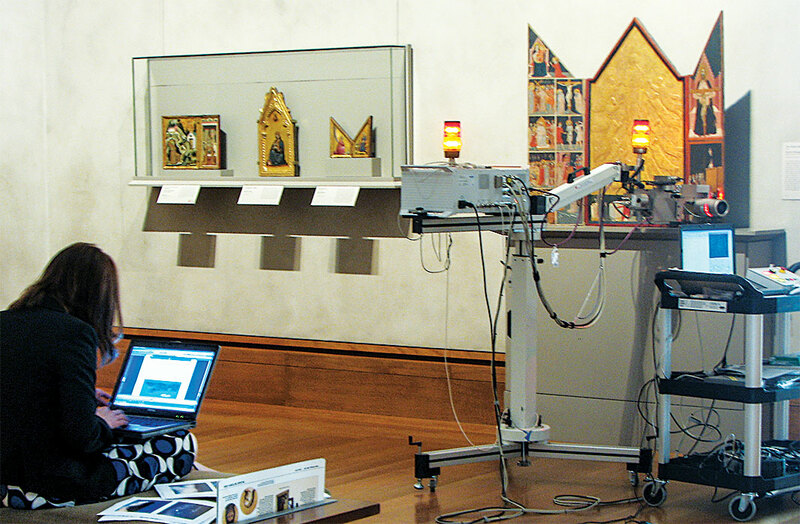 GCI research lab associate Carole Namowicz uses a micro-XRF spectrometer to examine the Getty Museum’s Chiarito Tabernacle by Pacino di Bonaguida. Photo: Karen Trentelman, GCI. Of the first three extramural projects, one went to Glen Cass at the California Institute of Technology to study the museum distribution and damage potential of outdoor air pollution in Southern California. The other two, on accelerated thermal and photochemical aging and on cellulose ethers, were both awarded to Robert L. Feller of the Mellon Institute. Feller was also on the NIC committee setting national research priorities. It is now clear that the national zeitgeist was suddenly and permanently impacting Williams’s Getty vision. Three hallmarks of the GCI—particularly its science program—have been its generosity in making informational resources available to graduate interns and postdoctoral fellows, providing midcareer training opportunities, and offering a quiet haven for scholars to complete important projects. Progress on scholars’ projects is often accelerated by access to GCI staff expertise and facilities. Sharing information resources began with our contribution of materials properties research to the Canadian MCIN (Materials Conservation Information Network) database and the assumption of responsibility for AATA (Art and Archaeology Technical Abstracts) in 1985. Today the numerous books available as downloadable PDFs from our website are our most heavily trafficked pages, second only to the home page. Two individuals who set the standard for other visiting scientists were Neville Agnew (the Queensland Museum) and Nieves Valentin (a 1987–89 research fellow). Agnew came to GCI to study adobe preservation for three months in 1986 and later returned as a staff member. Valentin continued a project conceptualized by Preusser that used a low-oxygen atmosphere for the preservation of cultural properties placed in hermetic display cases. The main goal was minimizing alterations in the chemical composition of historic materials. Within that project, an additional investigation was proposed to estimate the impact of an inert atmosphere (nitrogen) on biological agents, including microorganisms and insects commonly found in anthropological remains. This deinfestation system requiring different equipment and tools—designed, tested, and disseminated by the GCI’s Shin Maekawa—has been used widely in the last quarter century and is currently part of preventive conservation strategies in Spain and some Latin American cultural heritage institutions. Senior Scientist Shin Maekawa tests instrumentations for an environmental monitoring system to be installed in a historic house museum. Photo: Scott S. Warren, for the GCI. The number of visiting scientists and other scholars at GCI Science over the last thirty years is considerable. In the last ten years alone there have been approximately sixty-five science “visitors,” from nearly as many institutions, who spent from two weeks to more than a year enriching their research experiences. The graduate interns in science, selected for a year, have numbered around forty since 2000—about half the number the entire Institute supported during the same period (the Getty as a whole has hosted over 650 interns). By the mid-twentieth century, conservation research had settled into a focused discipline, examining unique deterioration conditions like waterlogged wood or finding a heretofore unknown pigment or corrosion product. The tools were simple and methods time-consuming. Scientists used pencils and paper or, later, simple calculators—not the gigahertz-wielding computers anyone can use now. Acquiring technical skills was massively labor-intensive and isolating, so once you mastered a technique, you kept right on using it. Studying more than a single object was a trade-off among time, availability, and the effort to learn a new technique. 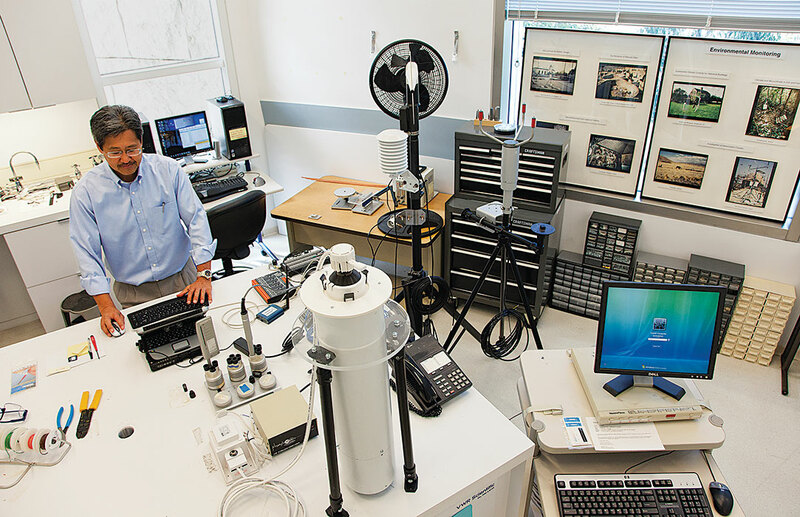 As imaging tools and analytical instruments became common and easier to operate, a major portion of a collection could be surveyed, and sample preparation could be automated. In the late 1980s GCI research was a mixture of external and internal research, but a further subdivision also existed. One laboratory, originally headed by David Scott, followed the paradigm of the rest of the conservation field, carrying out studies on single or small sets of objects of the Getty Museum. The remainder of the science staff was not bound to any particular collection. The focus for this latter group could be the Lintels of the Church of the Holy Sepulchre, the Dead Sea Scrolls, environmental controls in tropical climates, or the effect of building structure and ventilation on energy conservation or air pollution. But slowly both subdivisions began influencing each other. Those without a collection to study found themselves intrigued by the Museum’s collections, and those previously focused only on the Museum’s objects began to roam more widely. There was a concomitant switch from sponsored external research to collaborative partnerships. After 2000 these trends accelerated, and the entire GCI Science department began acting more collectively. The 1984 GCI model of independently contracted and in-house research has evolved to match a twenty-first-century style of research. Where once in-house staff, single objects, limited techniques, and individual collections characterized work, we now favor projects with many collaborators, the widest possible selection of techniques and methodologies, artifacts from varied institutions and locations, and shared staffing with unique expertise and skill sets. Although most GCI science utilizes these qualities, four current GCI projects exemplify this approach. Modern and Contemporary Art Research, Researching Florentine Workshop Practice, Managing Collection Environments, and the collaboration with the Disney Animation Research Library all examine large collections of materials on multiple levels, use diverse expertise and scientific techniques, and combine their chemistry and physics to resolve complex or seemingly insoluble problems. Conservation research has moved from the solitary activity of a few scientists using simple tools to a worldwide enterprise with a vast array of tools and volumes of automated data routinely deposited to the cloud. The GCI and its many colleagues are poised to shoulder this responsibility for the future. James Druzik is a GCI senior scientist. 1. Alison Heritage, Cecilia Anuzet, Erika Andersson, and Catherine Antomarchi, “The ICCROM Forum on Conservation Science 2013: A Collaborative Partnership for Strategic Thinking,” in ICOM-CC Seventeenth Triennial Conference Preprints, Melbourne, 15–19 September 2014, edited by J. Bridgland (Paris: International Council of Museums, 2014). 2. Principal Investigator: University of Illinois, Urbana-Champaign.